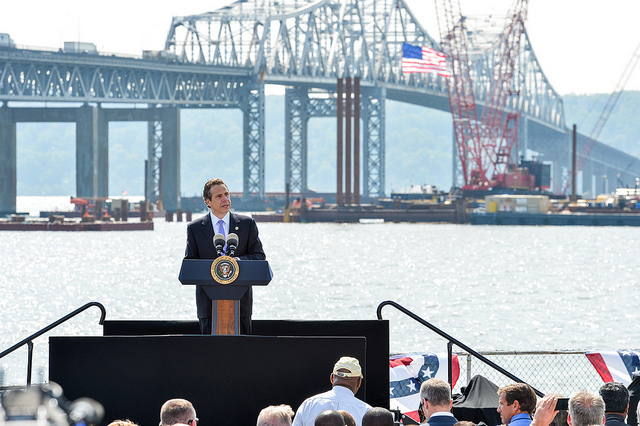 Who's paying for the $4 billion Tappan Zee Bridge replacement? By Dan Clark on Monday, August 21st, 2017 at 6:00 a.m.
New York state officials have been mostly quiet on how they plan to pay for the Tappan Zee Bridge replacement since announcing the project almost a decade ago. But Gov. Andrew M. Cuomo caused a bit of a stir when he replied to a question at a public forum from state Republican Chairman Edward F. Cox about financing for the new bridge, to be called the Mario M. Cuomo Bridge. "It’s part of the Thruway Authority," Cuomo said. "All the tolls are frozen through 2020. We have used cash to pay for part of the bridge over the past two years. And the remainder after 2020 will be paid with toll revenue from the entire system." That prompted this reaction from Cox after the forum. "That means all of upstate that uses the Thruway is going to be paying for the Tappan Zee Bridge, something he has not wanted to disclose for the bridge he is naming after his father," Cox said. Is Cox right? Will upstate Thruway drivers foot part of the bill for the new bridge connecting Westchester and Rockland counties? The New York State Thruway Authority projects the 3.1-mile replacement bridge will cost $3.98 billion. The state has already budgeted $3.65 billion of that cost. More than half of the cost will be covered through borrowing. The Thruway Authority has taken out an $850 million bond with payments through 2056. The federal Department of Transportation loaned the state $1.6 billion. Payments on the loan begin in 2023 and will last last 30 years. The state has spent $750 million on the project and has committed to spend $450 million more through 2018. The state will be on the hook for at least $2.45 billion in debt after construction ends in 2018. The Cuomo administration says the new bridge will pay for itself, leaving upstate drivers off the hook. "There has been no upstate toll revenue used to support the construction and financing of the new bridge, and no upstate toll revenue will be necessary to cover any remaining costs as the Tappan Zee currently provides significant funding for the Thruway system," Cuomo spokeswoman Abbey Fashouer said in a statement. The Tappan Zee Bridge currently subsidizes the rest of the Thruway system, Fashouer said. The bridge last year generated more than $141 million in toll revenue, about 20 percent of what’s collected from the entire 570-mile Thruway system. That may be enough to cover the cost of the new bridge over time, but it also leaves a hole in the Thruway budget. "Money is fungible. If you have a bridge that effectively spins off a subsidy for the whole system, and then build a replacement bridge that will eat up all the toll revenue and then some, it creates cost pressures for the rest of the system," said E.J. McMahon, research director at the fiscally conservative Empire Center. All of the Thruway’s revenue goes into one fund regardless of where the tolls are collected. The agency then spends the money as it sees fit. That does not mean tolls will necessarily increase to cover the cost of the new bridge or any other project. Lawmakers could earmark more state tax money to compensate for the lost revenue. They could also appropriate other funds toward the debt. New York state has collected several billion dollars in financial settlements in recent years, for example. Some of that money was used to freeze tolls on the Thruway through 2020. The debt could be paid off sooner rather than later if the state collects a similar windfall or cuts spending elsewhere. Cox said "all of upstate that uses the Thruway is going to be paying for the Tappan Zee Bridge." Cox may prove to be right. But for now, his claim remains unproven. The state has never released a full financial plan regarding the Tappan Zee bridge replacement program – a not-so-minor point that allows the state to leave wiggle room on how the work is going to be fully funded. Because current Tappan Zee tolls subsidize upstate roads, some revenue source will have to make up for that subsidy. Cuomo promises it won't be higher tolls – at least through 2020. Nobody knows what will happen after that. So we are withholding any rating. "All of upstate that uses the Thruway is going to be paying for the Tappan Zee Bridge."